Star Buick GMC's sales team is eager to walk you through the highlights of the 2018 GMC Acadia and get you behind the wheel for a test drive! This GMC mid-size SUV boasts an eye-catching design and innovative interior amenities that will ensure that you and your passengers are both safe and comfortable while on the road. With help from our GMC finance department, you can take home a 2018 GMC Acadia SUV today, so do not hesitate to make the short drive over from the Allentown area to our Easton, Pennsylvania location. You can also take time to explore our impressive GMC SUV selection online; be sure to contact us with any and all Acadia questions! Our friendly GMC experts will review all the stellar specifications of the 2018 Acadia family and listen attentively to your needs before introducing you to the Acadia trim model that complements your driving needs and budget. 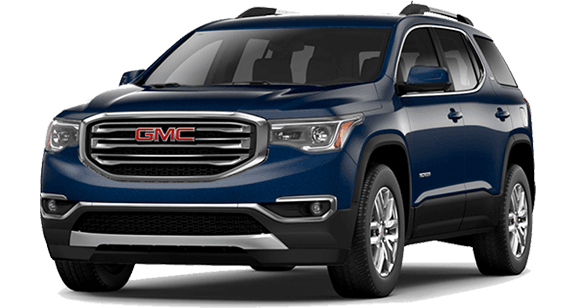 See the Acadia SLE-1, SLT-1 or SLT-2 or discover the benefits that come from buying or leasing a new GMC like the Acadia All Terrain package, which is offered on the SLE-2 and SLT-1 trim and provides a choice of 5-, 6- or 7-passenger seating configurations. For those of you looking for a fully-loaded 2018 GMC Acadia, the sleek and refined Acadia Denali is for you! From its hands-free power liftgate to its IntelliLink system, this SUV provides for all of your on-road needs with ease! And much more! Head to Star Buick GMC to see these systems in action and to let us know which Acadia trim model you're interested in; we'll go over all the standard and available features and can review your financing options! Talk to our friendly sales team members about the stellar standard safety systems and about how you can add-on features like a side blind zone alert to safely navigate your way through Allentown traffic. The Acadia's available Rear Park Assist and Rear Cross Traffic Alert can ensure you are safely backing up, as does the standard Rear Vision Camera. If you have teen drivers at home, ask our professional sales staff about the Teen Driver system that promotes safe driving practices! Experience the raw power of the four-cylinder 2018 Acadia engine, head to Star Buick GMC for a test drive. This GMC mid-size SUV boasts a six-speed transmission with stop/start technology so that you can cruise the streets of Easton, PA and beyond with confidence and efficiency on your side. If you're looking for a new SUV that offers some serious performance specifications, then check out the Acadia's 3.6-liter V6 engine option that also boasts Active Fuel Management! Add to that the GMC Pro Grade Protection and drive mode selector, and you've got one impressive GMC vehicle on your hands! Head to Star Buick GMC in Easton, PA for a hands-on experience of the 2018 GMC Acadia. The Star Buick GMC team will not only help you find the model and trim level that complements your lifestyle, but our service department will work to keep it running in peak condition for many years to come. Drop by our GMC dealership today or use our secure website to browse a few 2018 Acadia options right now! The Star Buick GMC team looks forward to speaking with you soon.